BLZ Extractor is a tool for retrieving the contents of the Nokia N-Gage game containers (files with 'BLZ' extension). Since these games run not only on N-Gage, but also on other Symbian-based smartphones, they are very popular, keep in mind, however, that you must legally own the game for which you want to use a corresponding blz file. CheatBook-DataBase 2015 is a freeware "cheat-code tracker" that makes hints and cheats (for PC, Walkthroughs, Playstation, Playstation 2, Playstation 3, Playstation 4, Sega, Nintendo 64, Nintendo DS, DVD, Gameboy Advance, Gameboy Color, N-Gage, Nintendo DS, Xbox, XBox 360, Xbox One, iPhone, Gamecube, Dreamcast, Super Nintendo, Wii U, Sony PSP) easily accessible from one central location. CheatBook-DataBase 2016 is a freeware "cheat-code tracker" that makes hints and cheats (for PC, Walkthroughs, Playstation, Playstation 2, Playstation 3, Playstation 4, Sega, Nintendo 64, Nintendo DS, DVD, Gameboy Advance, Gameboy Color, N-Gage, Nintendo DS, Xbox, XBox 360, Xbox One, iPhone, Gamecube, Dreamcast, Super Nintendo, Wii U, Sony PSP) easily accessible from one central location. 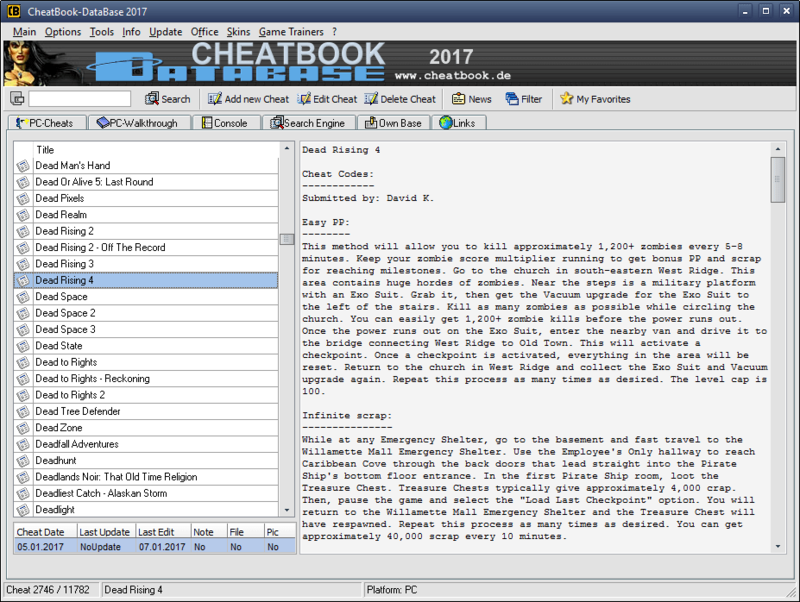 CheatBook-DataBase 2017 is a freeware "cheat-code tracker" that makes hints and cheats (for PC, Walkthroughs, Playstation, Playstation 2, Playstation 3, Playstation 4, Sega, Nintendo 64, Nintendo DS, DVD, Gameboy Advance, Gameboy Color, N-Gage, Nintendo DS, Xbox, XBox 360, Xbox One, iPhone, Gamecube, Dreamcast, Super Nintendo, Wii U, Sony PSP) easily accessible from one central location. 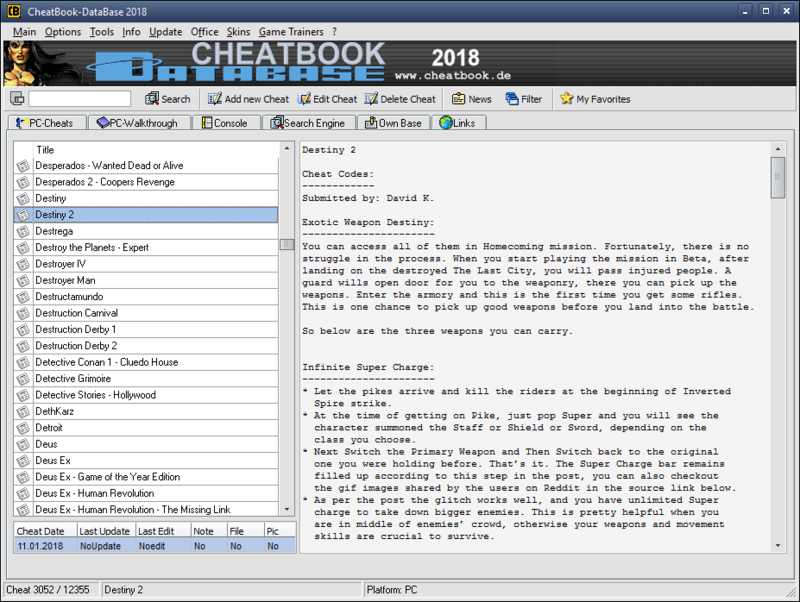 CheatBook-DataBase 2018 is a freeware "cheat-code tracker" that makes hints and cheats (for PC, Walkthroughs, Playstation, Playstation 2, Playstation 3, Playstation 4, Sega, Nintendo 64, Nintendo DS, DVD, Gameboy Advance, Gameboy Color, N-Gage, Nintendo DS, Xbox, XBox 360, Xbox One, iPhone, Gamecube, Dreamcast, Super Nintendo, Wii U, Sony PSP) easily accessible from one central location. 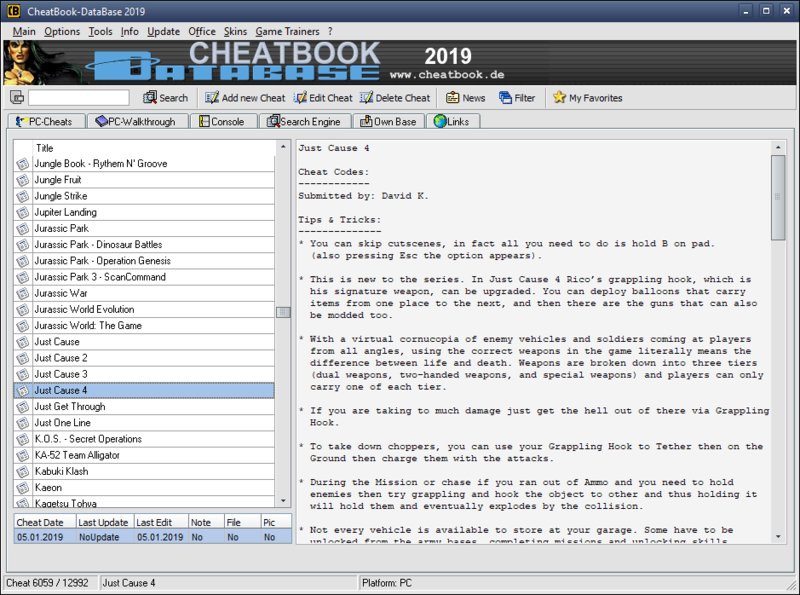 CheatBook-DataBase 2019 is a freeware "cheat-code tracker" that makes hints and cheats (for PC, Walkthroughs, Playstation, Playstation 2, Playstation 3, Playstation 4, Sega, Nintendo 64, Nintendo DS, DVD, Gameboy Advance, Gameboy Color, N-Gage, Nintendo DS, Xbox, XBox 360, Xbox One, iPhone, Gamecube, Dreamcast, Super Nintendo, Wii U, Sony PSP) easily accessible from one central location.